Black and white photograph showing the Eaton's of Canada Order Office at 109 Brock St. S. Rose Bailey (left) and Eunice Annan are the clerks behind the counter. They are assisting two unidentified women. 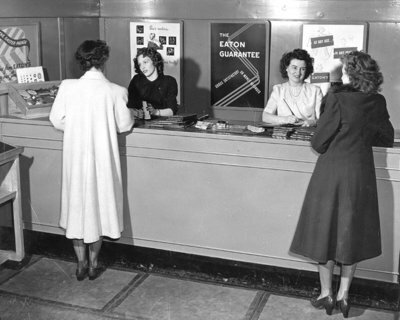 Eaton's of Canada Order Office, c.1954, Eaton's, Whitby Archives, 02-000-042.